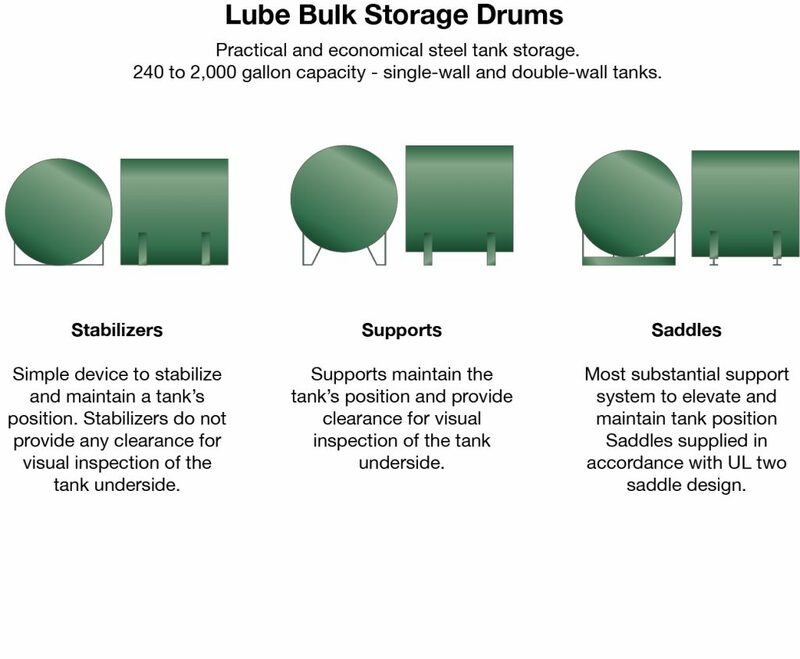 Lube Tanks provide safe and dependable bulk storage for all types of motor oils. Their superior steel welded construction makes them tougher than plastic tanks, and they’re more resistant to potential impacts and punctures common to vehicle maintenance facility operations. Lube Tanks are manufactured in a wide range of styles and capacities to meet all your replacement or new construction requirements. Whether you’re installing your Lube Tank indoors, in a basement, in a service bay, outdoors or next to a building, there is a convenient design for you. 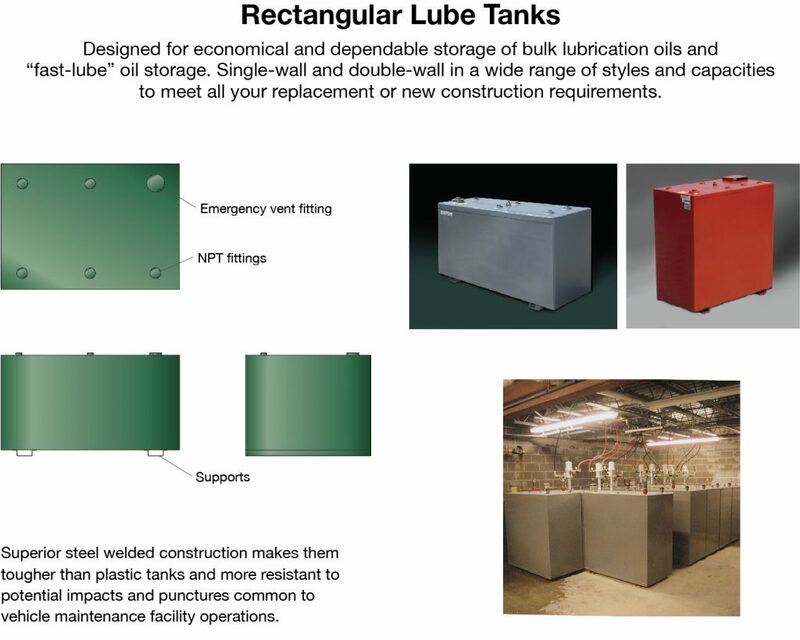 Rectangular single-wall and double-wall lube tanks are designed for economical and dependable storage of bulk lubrication oils and “fast-lube” oil storage. Lube Tanks are fabricated in a wide range of styles and capacities to meet all your replacement or new construction requirements. Whether installing indoors, in a basement, in a service bay, outdoors, or next to a building, Highland Tank can supply or build a lube tank to fit the application. 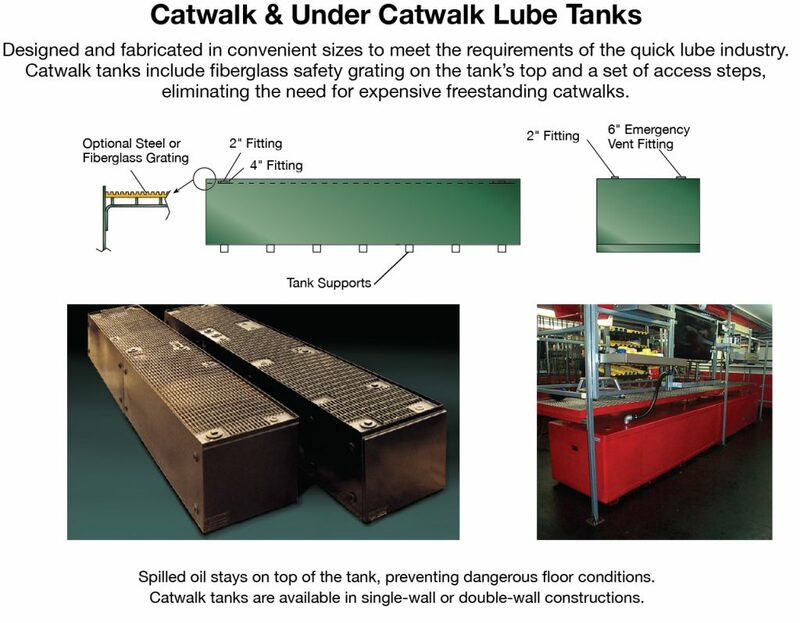 Highland Catwalk & Under Catwalk Tanks are available in convenient sizes to meet the requirements of the quick lube industry. Catwalk tanks include fiberglass safety grating on the tank’s top and a set of access steps, eliminating the need for expensive freestanding catwalks. Spilled oil stays on top of the tank, preventing dangerous floor conditions. Catwalk tanks are available in single-wall or double-wall constructions. 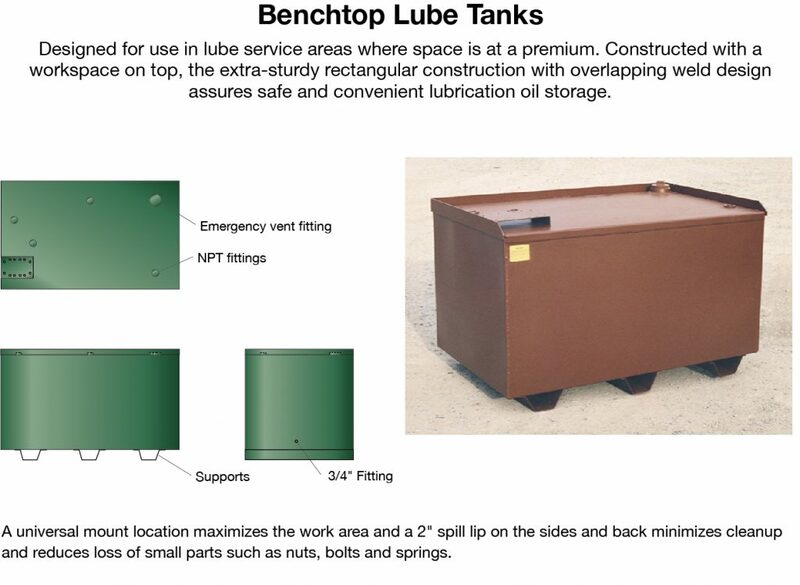 Highland’s Bench Top aboveground steel storage tanks are designed for use in lube service areas where space is at a premium since they are designed with a workspace on top. The extra-sturdy rectangular construction with overlapping weld design assures safe and convenient lubrication oil storage. The standard universal mount location maximizes the work area. A 2” spill lip on the sides and back minimizes cleanup and reduces loss of small parts such as nuts, bolts, and springs. Bulk Storage Drums store more product in less space aiding with bulk purchasing. Lube BDH tanks are ideal for fitting into spaces with limited height. Fabricated to UL-142 aboveground steel storage tank standards and are available in single-wall and double-wall construction. Highland Hoppers use state-of-the-art technology for low profile, secondarily contained aboveground storage of liquid fuels, new and used oils, waste solvents, and antifreeze. Hoppers are available in nine convenient capacities to meet every need. 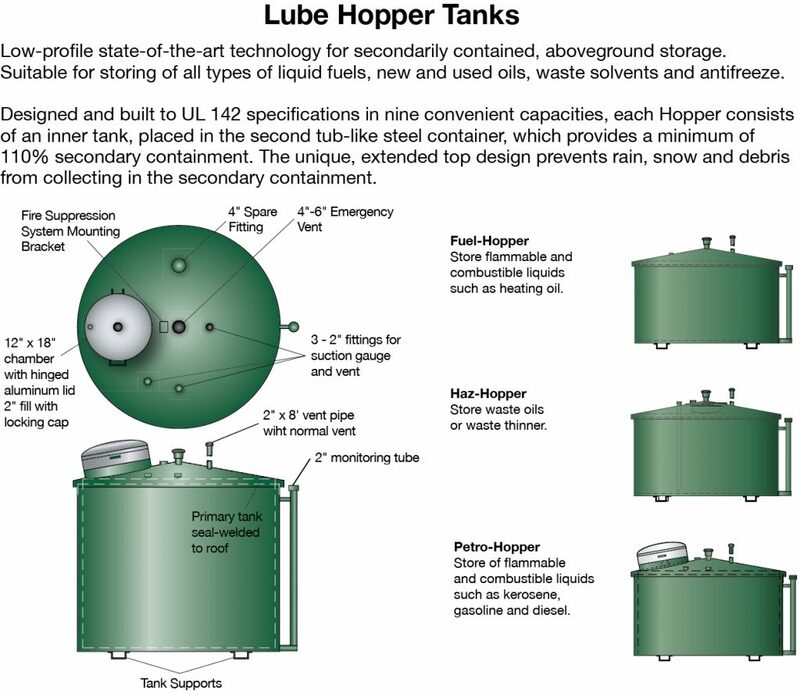 Built to UL-142 specifications, each Hopper consists of an inner tank, within a second tub-like steel container, providing a minimum of 110% secondary containment.